World Synod of Bishops, in their Oct. 24, 2008 gathering, said devotion to the word of God must lead Catholics to prayer, concrete acts of charity, unity with other Christians and dialogue with all people of good will. They also went on to say, "Every home should have its own Bible and safeguard it in a visible and dignified way, to read it and to pray with it." 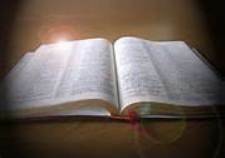 The Bible is God's living word, inspired by the Holy Spirit, revealing God's plan of salvation for mankind, written by human authors, relevant to all people of all cultures at all times. However, a book cannot listen, nor console, nor challenge, but the Lord does. He does this through the fellowship of His people that make up His church. The ministry of Wednesday Night Bible Discussion welcomes anyone who seeks fellowship so they may reflect and gain deeper understanding of the Word of God through the study of he following weekend's Mass Readings. We endeavor to explore ways to bring God's Word into our daily lives.